October is recognized as Breast Cancer Awareness Month, and many schools promote the awareness with ‘Pink Out’ events at their home football games. 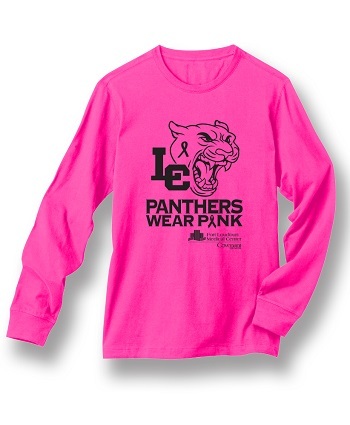 Lenoir City and Loudon High Schools hold Pink Out games each year and Fort Loudoun Medical Center is there to support. Attendees, players and cheerleaders are asked to ‘Wear Pink’ to support the cause. Fort Loudoun Medical Center has a special school t-shirt designed for the events. The proceeds from the shirt sales go to help with cancer outreach programs. Specifically, the funds go to the program called “Thompson Cares” established by Thompson Cancer Survival Center and Covenant Health, for women in the community who cannot afford a mammogram. All women are at risk for breast cancer and the risk increases as you age. About 1 in 8 U.S. women (12%) will develop breast cancer over the course of her lifetime. About 85% of breast cancers occur in women who have no family history of breast cancer. These occur due to genetic mutations that happens as a result of the aging process and life in general, rather than inherited mutations. All women age 40 and older should have a yearly screening mammogram. You can make an appointment by calling (865) 271-6070. For more information about breast health services available at Fort Loudoun Medical Center click here.